These are so easy to make and an excellent side for a grilled steak. 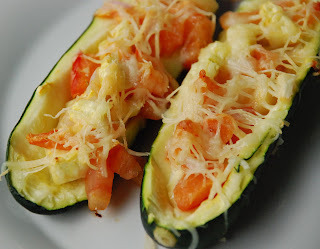 I soften the zucchini in the microwave for a few minutes. Scoop the flesh out of the shell and chop it with a small tomato and some onion. Place the filling back in the shell and top with shredded parmesan. Wrap in foil and place on the grill for about 20 minutes.